No. 2 Canadian General Hospital, Le Tréport, France. The incredible contribution of Canadian nursing sisters in the First World War can be best appreciated by examining their experiences during their service. Women left their families and homes to answer the call to duty and serve their country. Many worked in substandard conditions, with poor sanitation and limited supplies of water. They cared for soldiers with horrendous wounds caused by new advancements in weaponry. Canadian nurses adapted to a situation that was completely unlike their lives in Canada, and for which their work in Canadian hospitals could not possibly have prepared them. By drawing on their strengths and knowledge, they comforted and mended the soldiers in their care. Their dedication to their work, their country and, most importantly, to their patients, serves to measure their contribution to the Canadian war effort. Service files for nursing sisters who served with the Canadian Expeditionary Force can be searched in the Personnel Records of the First World War database. 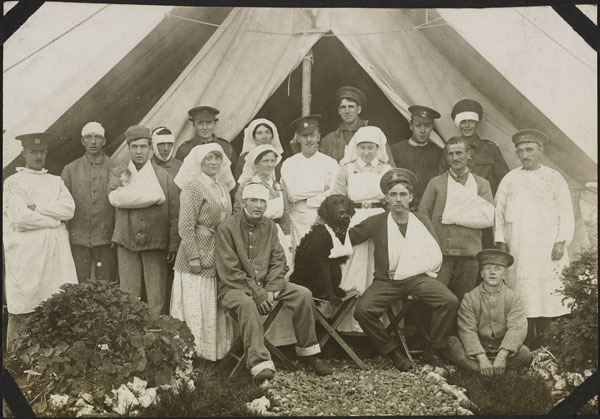 You can search for other files relating to nurses and nursing sisters in Record Group 24 (National Defence) and Record Group 150 (Ministry of the Overseas Military Forces of Canada) using Archives Search. Enter the keywords RG24 nurs*. Also try RG150 nurs*. Only one document from the first file on the above list is available online. That complete file and the other files in the list must be viewed on site. The Canadian Red Cross does not hold records relating to wartime volunteers and nurses. The essay "Caregiving on the Front" provides a history of nursing sisters during the First World War. We gratefully acknowledge the Canadian Museum of History and the University of Ottawa Press, who gave permission, and provided the files, for inclusion of the essay "Caregiving on the Front: The Experience of Canadian Military Nurses During World War I" from their book On All Frontiers: Four Centuries of Canadian Nursing. The digitization of Alice Isaacson's photo album was made possible through the generous financial support of the Canadian Nurses Association, and in collaboration with the Canadian Museum of History and the Canadian War Museum. We also thank Peter Robertson for his thorough work in restoring the album to its original order, his extensive research in the preparation of photo captions, and his creation of links between Alice Isaacson's photo album and her three diaries.